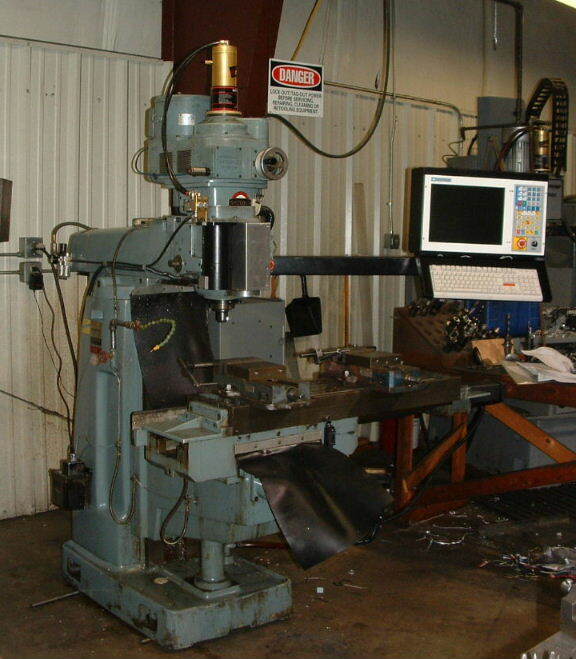 This is a Centroid M400S retrofit to a Shizuoka knee mill, completed by CNC Services Northwest in October 2005. The machine did not originally have limit switches, so during the retrofit I added roller-arm switches to X and Y, and optical switches to Z. We fabricated a larger quill cover to accommodate the optical limit switch assembly. I retained the original spindle start/stop and Emergency Stop controls on the right side of the quill housing. The Centroid electrical cabinet mounted on the right side of the column. The electrical cabinet is a standard M400S cabinet, with 110V power for the control system and 208V three-phase power for the spindle motor and coolant pump. 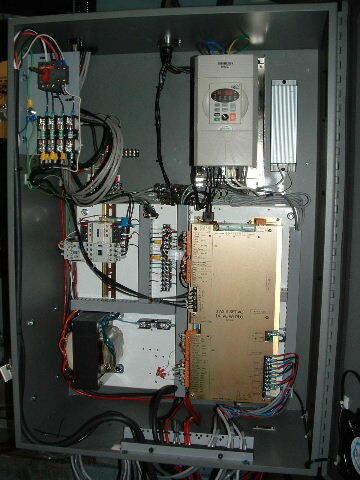 I installed a 3HP inverter (variable frequency spindle drive) in the upper portion of the cabinet, with its supporting EMI filter and braking resistor. I moved the original Shizuoka spindle motor plug into the top of the Centroid cabinet, providing a convenient connection for spindle motor power and cooling fan power.